Platinum and other precious metal prices have just gotten crazy-expensive these days. So, how do you get the look of white metal (platinum and white gold) without first winning the lottery? Try palladium, the new trend in white metal that is growing in popularity. Palladium is actually part of the platinum family of metals. According to a definition posted by Google palladium is "somewhat less expensive than platinum, it also does not tarnish, has good working properties and weighs only a little more than half as much making it a favored for use in large earrings." 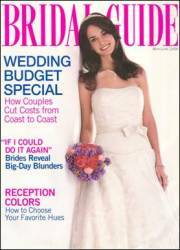 "The May/June issue of Bridal Guide (on newsstands in March 2006) features a preview of Novell's latest palladium product. The product will be available by the JCK Las Vegas Show in June 2006. This ring has 20 x .10 round diamonds. An approximate suggested retail price is $3600." Brides Say No to Diamonds?